Innovative box design doesn’t just mean a cool way to open up. Innovation also means making luxury packaging more cost-effective, so that products big and small can enjoy upscale value. And in the case of our new sleeve box, it’s all of the above. The sleeve box is another example of hybrid packaging. Unlike custom pads that are a hybrid of box and book, the sleeve box is more like a hybrid of materials. This custom piece opens like a matchbox. That retro slide action delivers elegance right from the start. Something familiar, but with a twist. The outer O-sleeve is made of SBS paperboard. Paperboard is lightweight, foldable, and extremely customizable. A pure canvas for crisp digital printing if there ever was one. But possibly it’s most-celebrated feature is the price. 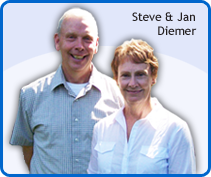 Printed paperboard is much more affordable than chipboard and transfers images better than corrugated. Chipboard is still the sweetheart of presentation packaging, but an SBS alternative keeps the cost per unit substantially lower. But the sleeve box also utilizes the stability of chipboard for its inner tray, giving your custom packaging the heft of luxury. Since the tray is rigid, it is available with all the trappings of an upscale presentation piece. Turned edges, custom wraps, embossing, debossing, even foil stamping. 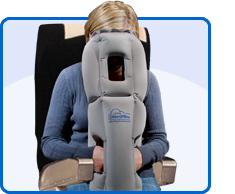 Of course, this also means a perfect fit for custom inserts; a thermoformed tray or die cut foam padding. A little more security never hurt, right? What this new custom box design means is even more products can get the luxury treatment. Upscale packaging is a must for retail, but for lower-priced products it can be hard to justify. With a sleeve box’s lower cost, items like flash drives, thank-you cards and invitations, and confections can have the same shelf appeal as fine jewelry. 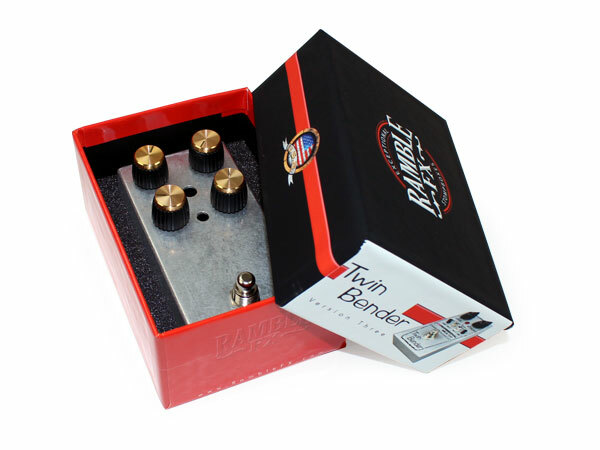 Minnesota’s own Ramble FX knows that an elegant piece of equipment like their Twin Bender fuzz pedal needs elegant custom packaging. The custom box we crafted for them definitely fits the bill. It truly puts the custom in customized. This luxurious custom package is a very unique combination of elements. The Ramble FX box is a rigid 2-piece setup box which means it has a strong, durable construction of sturdy chipboard that almost completely telescopes shut. A sliver of the bottom tray remains. This design is as functional as it is visual; the flash of red compliments the box while also providing a handhold for ease of opening. A custom package should always consider having this element or thumb notches for a smoother user interface. The top or outer layer of this custom packaging sports the impressive Ramble FX logo, brought to life with crisp graphics and protected with a soft-touch lamination. 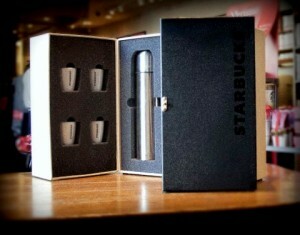 This soft-touch feature ratchets down the glare as well as giving the packaging a high-end feel. When you have your hands on the Twin Bender custom box, you know it’s a fine piece of hardware before you even open it. The bottom tray has it’s own unique glossy lamination, giving the red a glow while also giving the bottom a smooth, clean texture. The lower tray is fit with a foam insert, die-cut precisely for the pedal and matching the colors of the rest of the packaging. The devil is in the details, as they say. 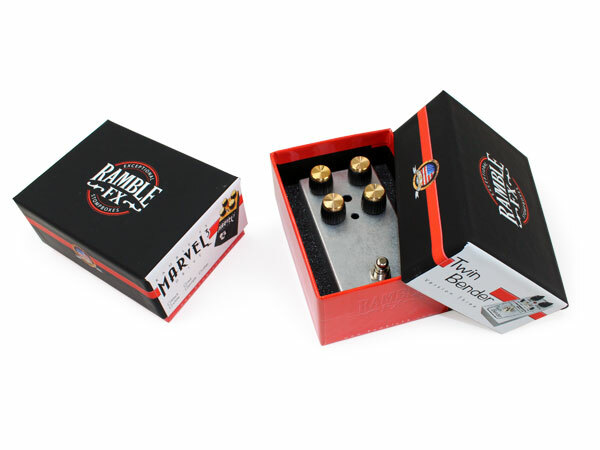 The Ramble FX custom box has a highly-impactful presence, garnering an appreciation from the buyer that is opening their purchase for the first time, or the onlooker that may be in the market for a fuzz pedal. Truly impressive, unique, and personalized for a standout look. 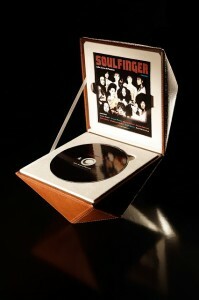 A beautiful frame for a masterpiece of musical equipment, and a testament to the added value of custom packaging. As always, it was a pleasure to contribute to this truly artful custom packaging presentation. Laurel Mountain Photography is an award-winning wedding photographer. Their accolades list is so accomplished, it makes you wonder if anyone else is shooting weddings these days. Their style is elegance, their subject is black tie formal, and their materials have to match. 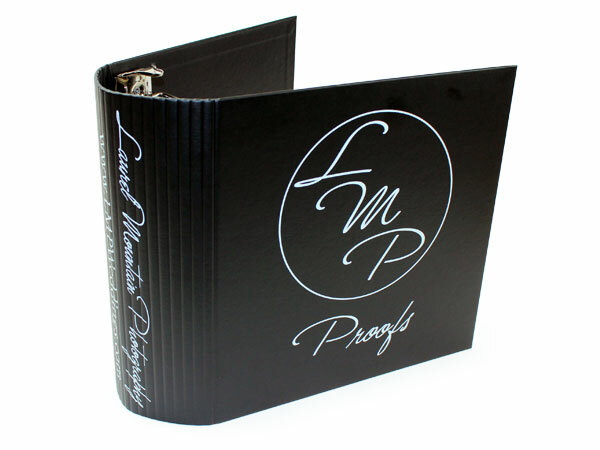 The product is this beautiful custom binder complimenting Laurel Mountain’s classy style. The chipboard cover features a 1-color silkscreen for that clean, minimalist look, proving that an overabundance of flare does not always stand out. Couple this with the organic-looking handwriting font and this custom binder is checking most of the boxes for this year’s trends. The rivets are exposed but blend in beautifully with the Dull Black Rainbow Ultima wrap color both inside and out, creating a stark backdrop for the white lettering. The D-Ring is 4” nickel, sturdy enough to store and display an entire day’s worth of memories in photo form. The rounded Euro-scored spine offers both a unique luxurious look as well as flexible binding, perfect for sharing with a group. 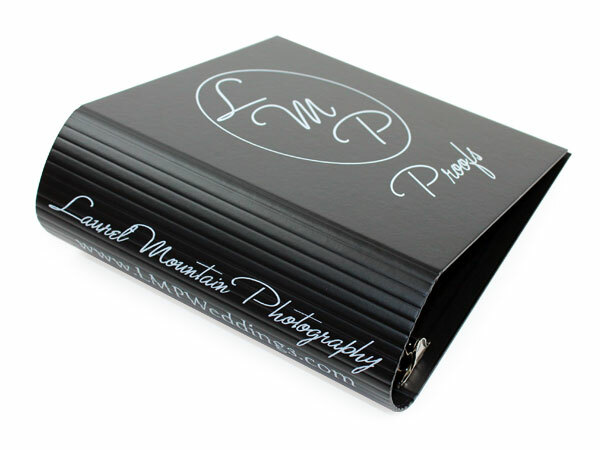 This custom binder truly matches the sophisticated and professional level of Laurel Mountain Photography’s award-winning business, adding that personal touch to remind their clients why they are the best in show. A visual trade needs to send a clear message with every element. This custom binder is for proofs, meaning it goes to the client. It’s the frame around the masterpiece, so it must still exude a sharp, high-end feel. Laurel Mountain Photography certainly knows how to stun. It was a pleasure to play a part in this custom binder design. This imaginative and unforgettable custom 2 piece setup presentation box for Taittinger champagne really hits the mark for branding. The champagne is stored in a set of presentation boxes each containing four bottles. These boxes are so unique they can be reversed for presenting of all four bottles. 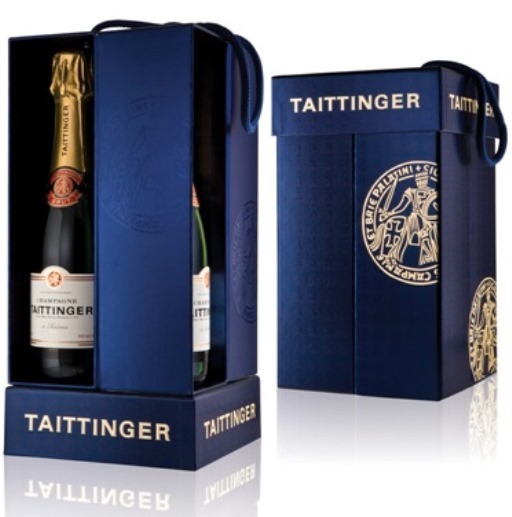 This highlight enhances the Taittinger’s shelf presence and improves value to the product. 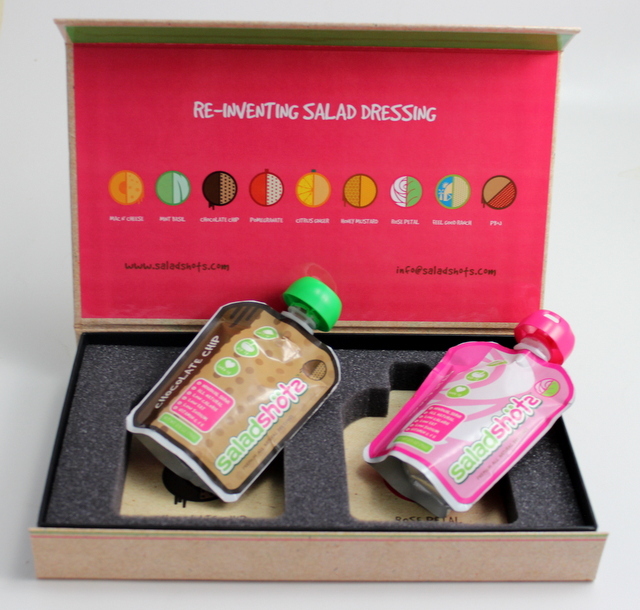 These custom two-piece presentation boxes are also strong enough to protect the bottles. The top works to generate the handle can be used as a tray in a complementary display feature. The Setup box is probably considered the most classic take on what a “box” actually is. Custom setup boxes comprise of two pieces which are a top and a bottom tray. Custom setup boxes can be put together a few different ways. To get the most sturdy and reliable type of this unsophisticated packaging solution, you should use a rigid setup that uses turned edge construction and presents distinctive customization options. 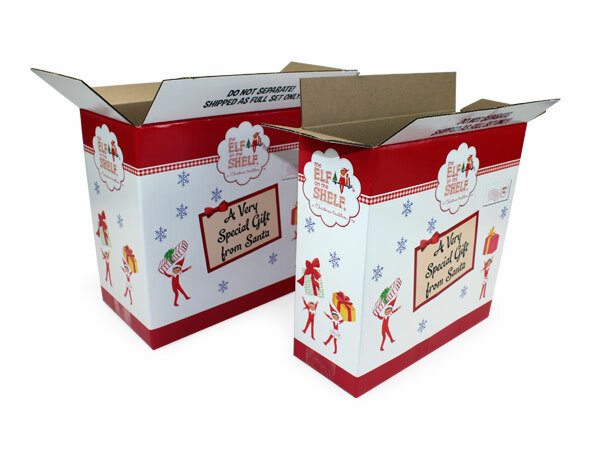 A custom rigid setup box can use a rigid chipboard that may be wrapped with custom artwork which helps give the entire custom box durable support. 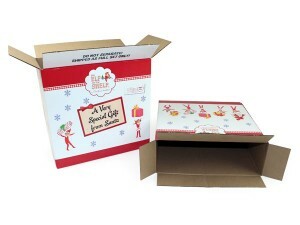 A great custom setup box design does wonders for your marketing your product and extending your brand. Sometimes the best way to promote the rollout of a new product or product line is to simple give distributors and clients a sample kit of what you have to offer. As they always say, sometimes you have to spend money to make money, which is exactly what you do when investing in a promotional kit for your brand. 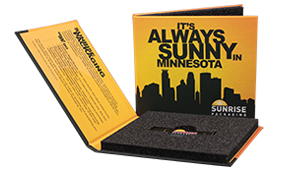 Shown here are just a few promotional packaging solutions that stand out to us. 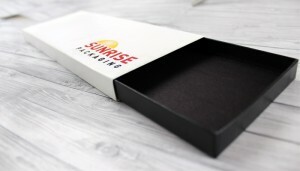 Of course, the e-cig box and the Starbucks box were both made by Sunrise Packaging (we thought we would throw in the disc box because it is just so cool!). Each product kit should have an element of design, a way to display the product, and durability to keep sample products protected. 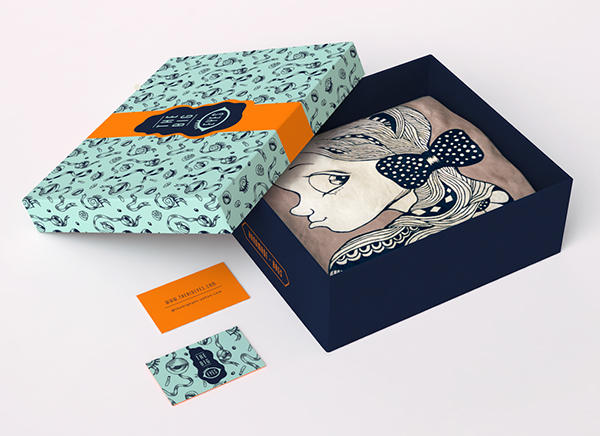 These kits used high quality turned edge boxes to portray a luxury design and brand representation. In order to display the product or line, both Starbucks and Mistic used high-end water-jet cut foam to hold each item in its proper place. 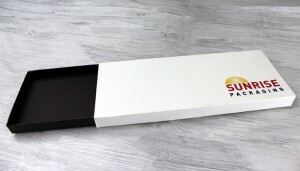 These durable promotional kits do more than just show your customers what to expect in the new product line, they show you that they are willing to invest in a demonstration kit to show you their standards in quality!